Integrated culture and cross-cultural research to understand child development. 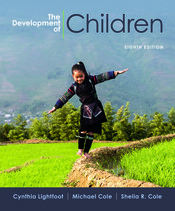 The Development of Children has long been acclaimed for its authoritative chronological exploration of how the lives of children are shaped by biological and cultural factors. In this thoroughly updated new edition, lead author Cynthia Lightfoot builds on the legacy of original authors Michael and Sheila Cole, offering a lively, engaging, and always accessible examination of child development as a process involving the whole child within multiple, mutually influencing contexts. Throughout, the emphasis is on how the interaction of biology and culture contributes both to the universal pathways of development shared by all children and to the diverse developmental patterns that unfold in the lives of individual children.